The following information is an extract from PEW recommendations on Arctic Oil Spill Prevention, Response, and Safety in the U.S. Arctic Ocean published during September 2013. Once exploration drilling is complete and sufficient oil and/or gas resources are found to support year-round production, a more permanent offshore production facility may be installed with a pipeline connecting it to shore. Offshore production facilities typically include development drilling operations, wellheads, processing facilities, storage, and living quarters. The offshore production facility and offshore pipeline will likely operate year-round. This means these facilities must be designed to account for strong ice forces and other Arctic hazards. Arctic OCS equipment should be designed in accordance with Arctic engineering practices, and operating standards should be based on worstcase historic weather conditions. Frozen for eight to nine months of the year, the Arctic Ocean features ice that varies in thickness, age, and strength. Facilities must be designed for new first-year ice vthat can be 5 to 7 feet thick; multiyear ice floes that can be miles wide and miles long and can consist of ice that is 10 feet to 100 feet thick; and icebergs. Six large multiyear ice floes in the Chukchi Sea have occurred since 2000, with the largest floe estimated to be 300 feet wide and 12 miles long with a 90 percent ice concentration. In February 2012, two large pieces of ice were discovered off the Chukchi Sea coast. The larger one was estimated to be 260 feet long, 131 feet wide, and 66 feet above sea level. In 1992, a massive ice floe in the U.S. Beaufort Sea measured several miles in width and length and was so thick that it grounded out (hit the seafloor) even in water depths of 105 feet. Facilities designed to withstand ice in the Beaufort and Chukchi seas need to be 10 to 20 times stronger than the large, temperate-water Gulf of Mexico platforms built for hurricanes and rough seas, or subarctic platforms used in south-central Alaska’s Cook Inlet and built to withstand ice and storm events. Offshore facilities designed for the temperate waters of the Gulf of Mexico or subarctic waters of Cook Inlet are not suitable for use in the Arctic. 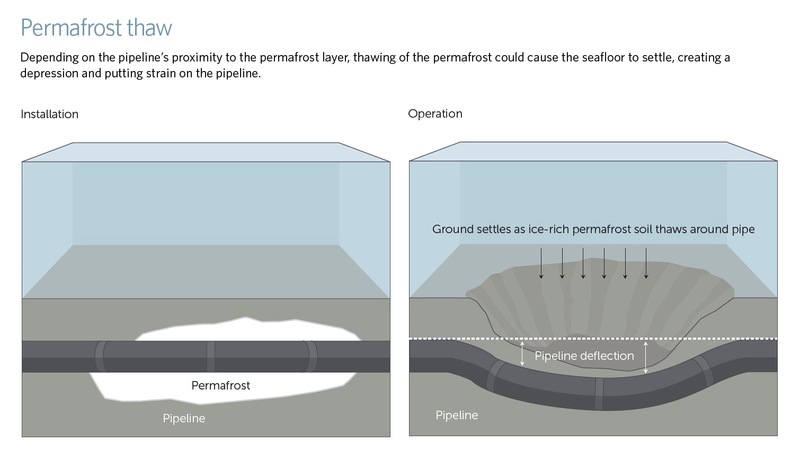 Bottom-founded structures or gravel islands, connected to shore by pipelines buried below the ice gouge and scour depth, have been proved to be the safest current design for Arctic offshore operations. In 2008, the US Interior Department funded a study of Arctic design concepts for both exploration and production facilities and drilling rigs in the Beaufort and Chukchi seas. 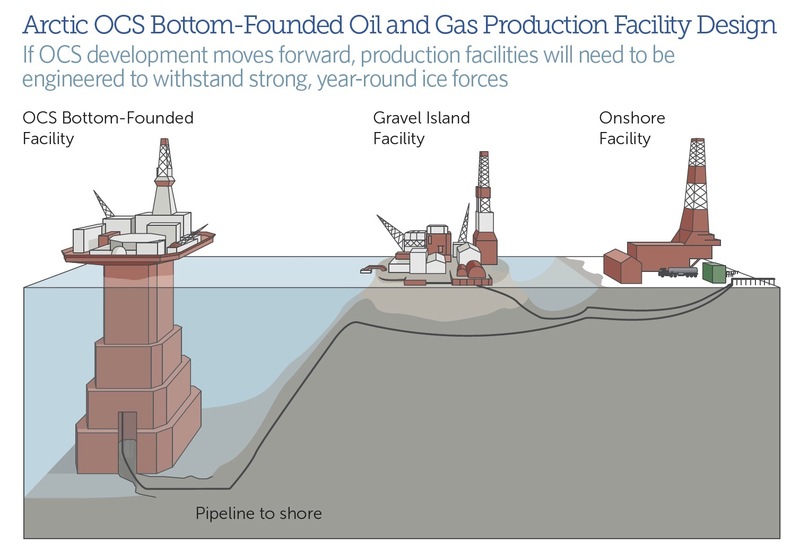 US Interior’s Arctic Offshore Technology Assessment concluded that bottom-founded platforms are safe and economical for the Arctic in water up to about 250 feet deep and gravel islands to about 60 feet deep, and that alternative designs in deeper waters will need to be developed. Other facility designs examined could not withstand the formidable crushing ice forces that are present year-round (see figure above). All Arctic offshore production facilities should use a bottom-founded design or be built on a gravel island if water depth allows for it. These facilities should be built and installed according to Arctic engineering practices and be able to withstand the worst-case geological hazards, Arctic temperatures, and wind, wave, and ice hazards that may be encountered. Offshore pipelines should be the required oil transportation method to move oil safely from the offshore facility to market. No tanker transportation of crude oil should be allowed during development due to the high risk of tanker transit in ice conditions resulting in ice damage to the hull, a collision, or grounding. These limitations should be met unless another alternative is proved environmentally preferable and safer. 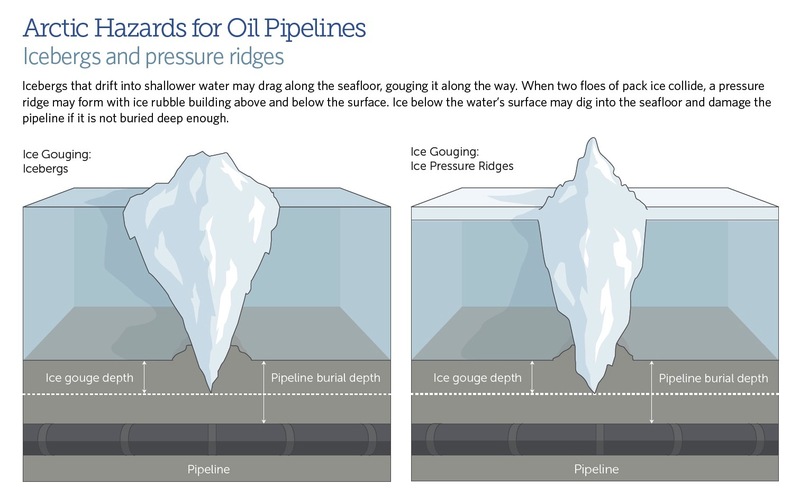 Arctic OCS pipelines may operate year-round, buried below the seabed. Response to an oil spill could be delayed up to six months for a pipeline leak under solid or broken ice. Because buried subsea Arctic pipelines are inaccessible for external monitoring, maintenance, and repair, they require a stronger design and additional oil spill prevention systems to be included in the initial installation. The installation of a tank and pump system provides a means of emptying the pipeline to control a spill, especially during periods when spill response is not possible. 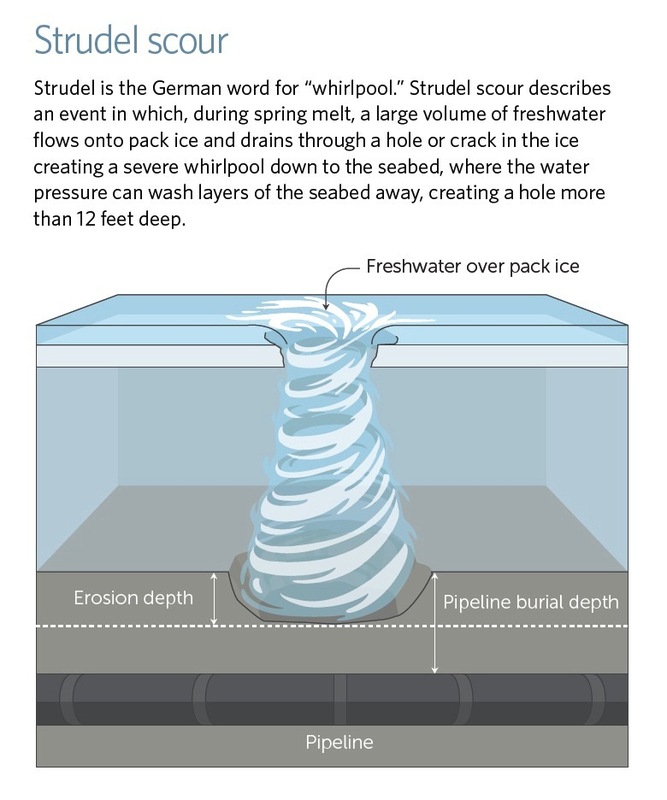 Pipelines should be buried below the depths of seabed ice gouging and ice strudel, and be designed to minimize settling due to permafrost thaw. Pipelines should be constructed using double-walled pipe or multiple pipelines and should be contained inside one larger pipe (a utilidor or pipe-in-pipe system) to provide a redundant pipe wall for secondary containment of oil in case of a leak. No single-walled pipelines should be allowed. Two leak-detection systems should be installed on the pipeline to provide redundant leak-monitoring capability. Tank and pump systems should be installed capable of completely evacuating the pipeline either to an offshore facility or to an onshore storage location in the event a leak is identified. Pipelines should be designed and operated to prevent corrosion and be equipped with access points for launching and receiving corrosion-detection equipment (commonly called “smart pigs”) and pipeline maintenance equipment (commonly called “pipeline pigs”). Pipelines should have a robust inspection, monitoring, repair, and replacement program. Crude oil and fuel storage tanks used in the Arctic OCS pose a spill risk. Fuel tanks store fuel to be used in combustion equipment. Offshore crude oil tanks may be used to store oil before sending it to shore in a subsea pipeline or for evacuating and storing oil from a leaking pipeline. The best strategy is to build robust tank systems with accurate leak-detection systems and a means to evacuate oil from the tank if a leak is detected. Arctic tanks should be built of double-wall and double-bottom construction and be designed and operated to prevent corrosion. Arctic tanks should have a robust inspection, monitoring, and repair program. Arctic tanks should have a leak-detection system installed between the double-bottom that is equipped with automated visual and sound alarms and automated overflow alarms. Arctic tanks should be connected by piping to one or more additional tanks that are able to hold the leaking contents in the event of a leak. For more information on Arctic OCS equipment design and operating standards based on worst-case historic conditions please refer to Appendix I of the PEW Arctic Standards by clicking on the link identified below.